Experience a convenient, twenty minute anti-ageing treatment with the BeautyPro Eye Therapy Under Eye Mask with Collagen and Green Tea Extract; three pairs of cooling under-eye patches that target and eliminate signs of ageing to awaken a fatigued eye contour. 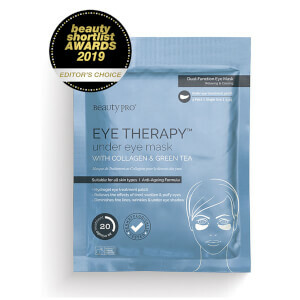 The hydrogel patches are rich in Green Tea Extract, Aloe Vera and Marine-based Collagen, which work in synergy to deliver an array of skincare benefits. The intensive treatment is able to reduce the appearance of fine lines, wrinkles and dark circles, whilst reviving a fatigued and puffy eye contour. 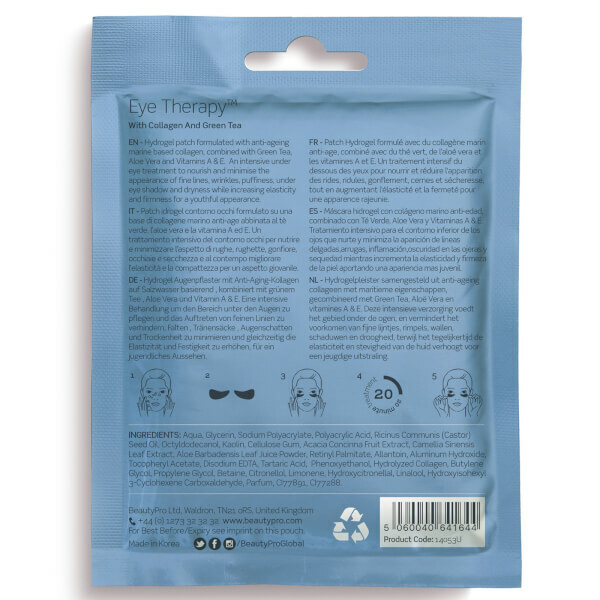 The soothing and relaxing treatment hydrates and nourishes skin in just fifteen to twenty minutes, leaving eyes energised and youthful from the first use. Key Ingredients: Marine Collagen, Green Tea Extract, Aloe Vera, Vitamin-A, Vitamin-E, Citrus Extracts.